Writing a novel is like birthing a baby. And like a baby that book comes with its own genealogy. This is love story and historical fiction born out of quest for voices silenced in 1813 ...to now be forever remembered. Before my research began DAR and Colonial Dames were my "country home" and then the ghosts of my "forgotten heritage" grew louder in their cry for redemption guiding me to the story which became....SWIMMING WITH SERPENTS. SWIMMING WITH SERPENTS began in the Fort Crawford cemetery in East Brewton in Escambia County, Alabama. My grandmother took my mother and me to her parents’ graves. She smiled at me and indicated a copse of woods, “That’s where Red Eagle jumped off the cliff,” she said. It really wasn’t, but it took a fourth grade Alabama history class and revived interest years later to learn the real story. Perhaps the beginnings came with the picture of the Native American Indian in full headdress with his arms lifted in prayer that always hung in my grandmother’s bedroom. Maybe the story actually began when I discovered our family secret. My fourth great grandmother was an Indian (Native American in modern parlance). By then I had begun posting genealogy and history on my website -- southern-style.com. A cousin emailed me about a genealogy book written by Don Greene entitled Shawnee Heritage I and through that book I was able to confirm the whispers of our Native American heritage. I contacted Greene requesting more information. He then referred me to Edward Cashin’s, Guardians of the Valley, the story of Vashti Vann’s grandfather, the Squirrel King of the Chickasaw, whose roll as fanni mingo (mediator) was critical to the survival of the colonies of Georgia and South Carolina. Vashti Vann’s uncle was Chief James Vann who was at the time of his murder in 1809 one of the richest men in the United States and lived in one of its most gracious homes. His son entertained President Monroe in 1819. The name Vashti reveals an educated Bible reader in that family. Through keeping her secret, she and her family avoided the Trail of Tears. But others of our blood did not. The irony of Andrew Jackson sitting at the table of my Native American ancestor, eating the food she had prepared-- and then years later sending her relatives on the Trail of Tears piqued my curiosity and I began reading all I could about the time and place in which my grandmother lived. The Massacre at Fort Mims occurred on August 30, 1813, and became the first battle of the War of 1812 in the south. “Remember Fort Mims” became the cry that rallied troops to enlist. Yet time passed and the event faded into a dim memory and the place grew over with weeds and got surrounded by dilapidated trailers where once 500 took refuge. Standing knee deep in weeds at my first visit, I imagined the one acre fortification as the gracious home of Sam and Hannah Brady Mims welcoming visitors there on the bank of Boatyard Lake. Then surrounded by a stockade and inhabited by 500 men, women, children, black, white and red taking refuge, it became Fort Mims. During the American Revolution, Sam Mims worked as a pack man for George Galphin at Silver Bluff (now Augusta, Georgia), near where my fourth great grandmother Vashti Vann’s father and grandfather had peach orchards and made peach brandy on the Savannah River. His travels into the Creek country showed him the value of that spot on the Federal Road where a ferry would be needed. He owned about 600 acres of land and with his 33 slaves built a fine home on the Cutoff on the Tombigbee Travelers on the Federal Road. When the Red Sticks rose up, he built a stocade about an acre of his land encompassing his home. This became Fort Mims. Those who wound up in the fort on August 30, 1813, only meant to take Mims Ferry across Boat Yard Lake, then over Nannahubba Island to Hollinger’s Ferry to cross the Tombigbee and make their way to St. Stephens, then the eastern most city of the Mississippi Territory and the seat of government. But the Red Stick rising caused them to take refuge among the residents targeted for their disloyalty to the traditions of their people within the fort. Many mixed blood kinfolks of the Red Sticks (the war party among the Creeks) who attacked the fort sought safety there. Red Eagle, William Weatherford, led the attack on Fort Mims. His sister-in-law, Mary Louisa Randon Tate, and two nieces of the Red Stick, inhabited the fort along with other relatives. A genealogical study shows close family relationships between many of those within the fort and those who attacked that fort. The story of Jackson’s army (which also included some of my ancestors) is told over and over, but who tells the story from the Native American perspective? Many scholars still cling to the stereotypical characterizations of those involved in these historical events. Doing so makes the betrayals and confiscation of lands more palatable. Fifteen years of research into the real story of those people led to the writing of SWIMMING WITH SERPENTS. Thus the writing of SWIMMING WITH SERPENTS became a labor of love. Who were those people? Why were they there? Because of poor genealogical records, tracking those stories took fifteen years. The true story of James and Samuel Smith and Aletha Arundel as related by James and Aletha’s descendant, David Mason, in Five Dollars a Scalp, inspired the main characters of the novel. I fictionalized these true historical characters and created the characters of Cade and Gabriel Kincaid and Lyssa Rendel. SWIMMING WITH SERPENTS is a love story set against the back drop of the Creek Indian War. Indeed, my own grandparents lived there in that time and in that place and this could just as easily have been their story. In 1803, three children traveled with General John Twiggs down the Federal Road across Creek Country. Ten years later their lives get caught up in the brothers war that was a part of the War of 1812 known as the Creek Indian War. Lyssa Rendel, a precocious child schooled by her gifted father, she does not fit in. She reads and quotes Shakespeare and is always accompanied by the animals that became her true friends because of the cruel prejudice and stigma that surrounds her. Her mixed blood mother, granddaughter of Choctaw chief Pushmataha, survives an assault and her father decides to move his family to live among his wife’s people because they are more accepting of bi-racial marriage. Cade and Gabe suffer the same prejudice. They survive their capture by the renegade Creek Savannah Jack and the power mad adventurer, pirate and British sympathizer William Augustus Bowles who seeks to establish himself as Emperor of the Creek. But the scars of their kidnapping impact Cade in a way that takes the sensitive Lyssa to understand and eventually heal. Ten years pass since they first meet on the pack train and Lyssa decides she has waited long enough for Cade to follow through on his childhood promise to come for her. With the help of her brother Lance and Cade’s brother Gabriel who worries about the nightmares Cade continues to suffer as the result of the kidnapping, she manipulates a wedding. The hostilities of the Red Sticks take Cade away to save his sister and the people who raised him and his brother. Lyssa follows and arrives at Fort Mims just after the Massacre on August 30, 1813. William Weatherford, of Creek, French and Scottish descent, led the attack on Fort Mims. Lyssa rescues Cade and Gabe’s little sister and others before getting kidnapped by the greatest villain of the age, Savannah Jack, along with adventurer William Augustus Bowles. Cade and Lyssa must survive the Creek War to reunite. Writing SWIMMING WITH SERPENTS left me wondering what happened to those who survived the last battle of the Creek War, the battle of Horseshoe Bend. The Creek War ended with the confiscation of 20,000,000 acres of Creek Land by Jackson with the Treaty of Fort Jackson. The Treaty of Ghent signed by the British and Americans decreed that the lands be restored with pre war boundaries. The United States ignored this part of the Treaty and that left many Creeks homeless. Dispute over that land led to the First Seminole War. One band shared a common ancestor with Tecumseh, the Shawnee who came to Tukabatchee (a major Creek village on the Tallapoosa River) to urge a tribal confederacy. Tecumseh, Seekaboo, Peter McQueen, Josiah Francis and Billy Powell (Osceola) were all descendants of James McQueen who came with Oglethorpe, married a Creek woman of the Clan of the Wind, and lived to be 128 years old. McQueen and Francis played prominent rolls in both the Creek War and the First Seminole War. Billy Powell became the great Osceola of the Third Seminole War. More of their story is told in the sequel in this family saga, In Pursuit, released by Mercer University Press in 2013. Jackson’s public relations machine dehumanized and degraded the Native American in order to garner public approval for his ultimate goal -- the confiscation of their lands to achieve the manifest destiny of the United States. Much of that prejudice remains among scholars and critics. This conflagration has lessons needed now with a 200 year perspective. Book Club study questions appear on this website. I like to laugh a little when I read and I don’t see why humor and history cannot go hand in hand. And, I wanted to make the novel interesting to a broad readership to provoke interest in our Native American story. I wrote what I wanted to be a fun read where you can enjoy the story and learn at the same time. “A spoon full of sugar makes the medicine go down,” as Mary Poppins would say. So be prepared to sit back and enjoy the ride. 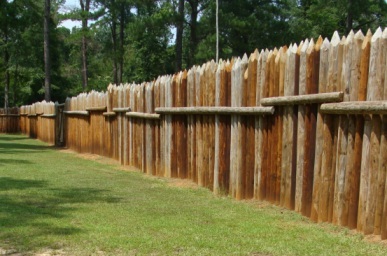 Fort Mims is located about 15 miles from the Wind Creek Casino on the Poarch reservation just north of Mobile. The 200th anniversary of this event took place August 30, 2013. If you have never visited Mission San Luis I highly recommend you do. When I tell you that 3000 people gathered to hear Tecumseh speak you can better understand the council house if you have actually experienced one. The Mission is located on its original site with buildings recreated where they would have originally stood. 800 bodies remain buried in the Mission church. Take your children and grandchildren. We took our then 8 year old granddaughter and she thoroughly enjoyed the visit.